The Highlander offers excellent visibility in all directions, from all three rows. And it’s a hushed cabin, too, thanks to acoustic-type glass used for the windshield. A measurement of the popularity of three-row crossover sport utility vehicles – such as the Toyota Highlander – is the way they have taken the place of minivans, once the family vehicle of choice. Minivans are still the most practical and efficient passenger automobiles on the planet. They seat up to eight people comfortably with plenty of room for cargo, while also offering decent handling and good fuel economy. 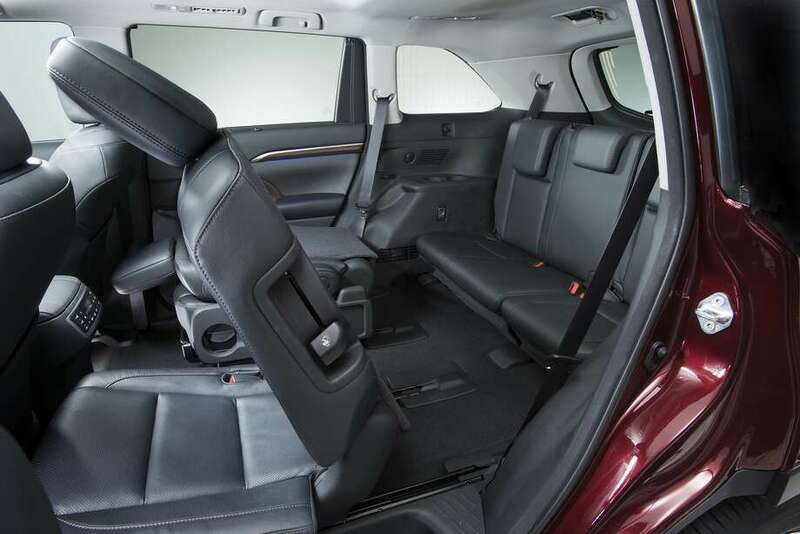 In contrast, midsize crossover SUVs usually have a cramped third-row seat and minimal cargo space unless you fold that third row. They all have available all-wheel drive, which minivans do not offer (except for the Sienna). Yet look at the numbers. In 2015, the six minivans available in the U.S. had total sales of 503,995. Other manufacturers have either bailed out of minivans or never offered them. Midsize crossovers had 1,124,992 sales. Crossover SUVs accounted for 69 percent of the total, while the minivans managed just 31 percent. How to account for it? Well, there are those who say they would not be caught dead in a minivan. A high-seating position and the image of crossover SUVs likely are other factors, as is the choice of a front- or all-wheel drive configuration. There’s nothing wrong with the big crossovers, as the tested 2016 Toyota Sienna Limited Platinum demonstrates: This is a plush vehicle that offers long-distance comfort, decent performance, and okay handling, all along with foul-weather capability because of the all-wheel drive. Objectively, it doesn’t offer nearly the space and utility of its garage-mate, the Sienna minivan. The tested Limited Platinum model is the Uber Highlander. For $45,390, it comes equipped with every choice on the option list, including state-of-the-art safety equipment like a pre-collision system with automatic braking, blind spot monitoring with cross traffic alert, lane departure warning, adaptive cruise control, and hill start, and downhill braking assist. It also comes with what are becoming standard features on most vehicles: stability and traction control, anti-lock brakes, electronic brake force distribution, a rear camera, and rear parking sensors. In other respects, this Highlander, which has a base price of $29,990, is almost luxury car-like in its demeanor, with plenty of sound-deadening technology for a quiet ride, and a supple suspension system that absorbs the increasing bumps, grinds, and potholes on the roads that governments at the local, state, and federal levels seem unwilling or unable to repair. Comfort is first-rate in the first and second rows. The Limited Platinum tester was a seven-passenger model with two captain’s chairs in the second row that delivered the same comfort and support as the two front seats. On the test model, perforated leather front seats were heated and cooled; second-row seats had heaters. A bench seat can be ordered for the second row, increasing the passenger capacity to eight, and the center rear position is reasonably comfortable thanks to a nearly flat floor. The difficulty comes with the third row, which supposedly seats three, but is small and cramped, and suitable mainly for small children or larger bodies in an emergency. Moreover, it takes physical dexterity to squirm back there, although a simple single lever flips the second-row seat forward for access. Family friendly surroundings include an abundance of cup holders and dedicated spaces for juice boxes. A roll top console between the front seats easily accommodates a large purse, though it doesn’t lock. In this era of proliferating subcompact and compact crossover SUVs, the Highlander feels quite large at first. But at an inch shy of 15 feet long, it is maneuverable in traffic and reasonably easy to park once you get used to it. There’s plenty of muscle from a 270-horsepower V-6 engine with 248 lb.-ft. of torque, which delivers its power to all four wheels through a six-speed automatic transmission and full-time all-wheel drive. City/highway/combined fuel consumption is 18/24/20 mpg – respectable for a 4,500-pound vehicle. If you have a big family and travel a lot, and you want the confidence of all-wheel drive, the Toyota Sienna still should be your hauler of choice. But if you simply can’t abide a minivan, check out the Highlander. TURNING CIRCLE (curb-to-curb): 38.7 ft.